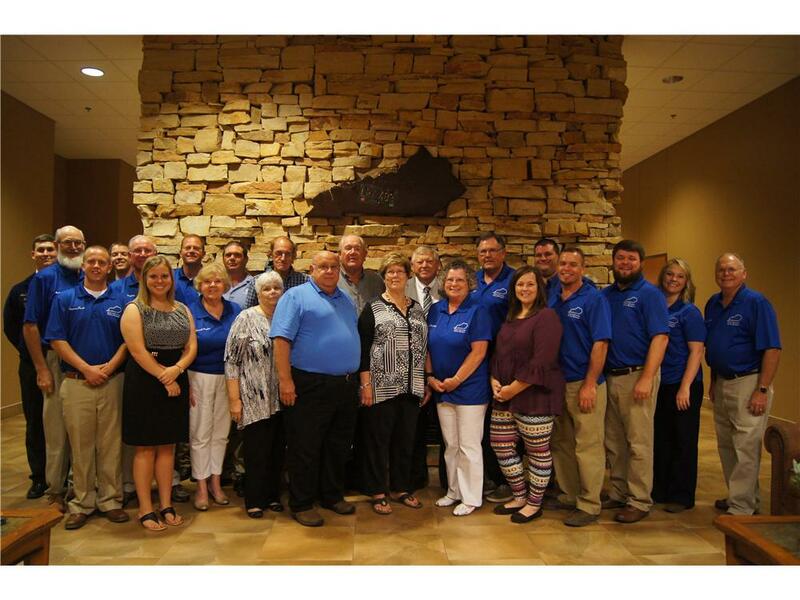 The Logan County Farm Bureau Federation held its annual meeting Saturday, Sept. 17 at the Extension Office with approximately 200 members in attendance. The Logan County High School FFA prepared and served a grilled steak sandwich dinner. Following the invocation by Russell Poore, the pledge of allegiance to the American flag was led by FFA President Andrew Milam.FFA. President Jeremy Robertson presided over the program and meeting. Farm Bureau State Board Member Poore introduced special guests including Logan County Judge Executive Logan Chick, Sheriff Wallace Whittaker; magistrates Thomas Bouldin, Drexel Johnson and Jo Orange; City Council members Darlene Gooch, Larry Wilcutt and Jack Whipple; State Representative Martha Jane King; Field Representative for Rand Paul Jason Hasert; Division Director from FB State Office Matthew Ingram; and Clark County FB President Larry Clark. Robertson introduced the 2016 Leadership in Ag and Logan County Farm Bureau Scholarship Winner, Lilly Robertson. She will also be one of the four finalists in the Discussion Meet scheduled to be held in Louisville at the FB State Annual Meeting in December. 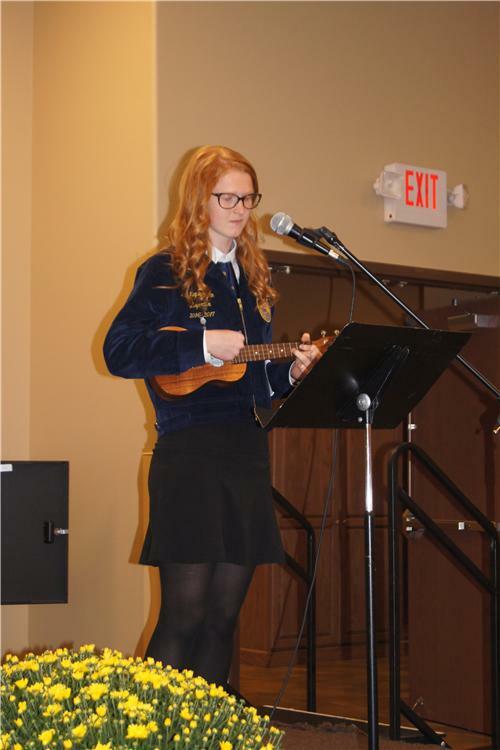 The 2016 KYFB Federation scholarship winner was Elizabeth Anne Hughes. Special guest Jessica Monroe Winn presented the Oliver and Lillian Monroe Scholarship to Jaylee Chick and Callie Newman. Wesley Estes and Morgan Hunt introduced the Outstanding Youth contestants. The female winner was Meleea Reno, 1st runner up: Ann-Meguiar Bouldin and the 2nd runner up Jenna Robertson. The male winner was Andrew Milam, 1st runner up: Zac Milam and 2nd runner up was Evan Hughes. Estes introduced the Variety Contestants. The variety winner was Ann-Meguiar Bouldin. The Variety 1st runner up was Madelyn Hughes. The Outstanding Youth and Variety Show judges were Al Pedigo, Deloris Pedigo and Lana Storm from Allen County FB. The 2016 Institute for Future Agriculture Leaders (IFAL) participants were Paige Brown, Jessie Collins and Dru Brown. Frances Brown presented the nominating committee report. The following officers were elected for 2017: President Jay Campbell; 1st Vice President Doug Milliken; 2nd Vice President Frances Brown; Treasurer Albert Brown; Women’s Chairman Jennifer Ferris; Women-s Co-Chairman Karen Milliken and Young Farmer Chairman, Grant Hildabrand. The directors elected for a two year term were: John Alcott, Frances Brown, Ray Hughes, Carrell Hughes, Albert Brown, Patsy Poore, Trent Martin, Thomas Poole, Jerry Hughes, Jeremy Robertson, Tabatha Robertson, Jay Campbell, Brad Hall and Paul Gripshover. 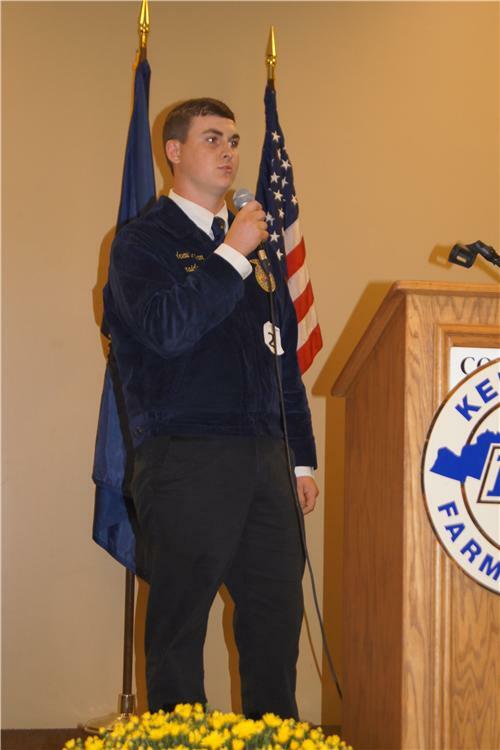 FFA President Andrew Milam was elected to a one year term. Directors with one year left to serve are Bobby Dawson, Richard Moore, Jonathan Brown, Gary Jenkins, Jennifer Ferris, Daniel Johnson, Grant Hildabrand, Dwight Grise, Russell Poore, Daniel Gaston, Doug Milliken, Wesley Estes and Karen Milliken. The FB Scholarship fund received $477.78 in donations. 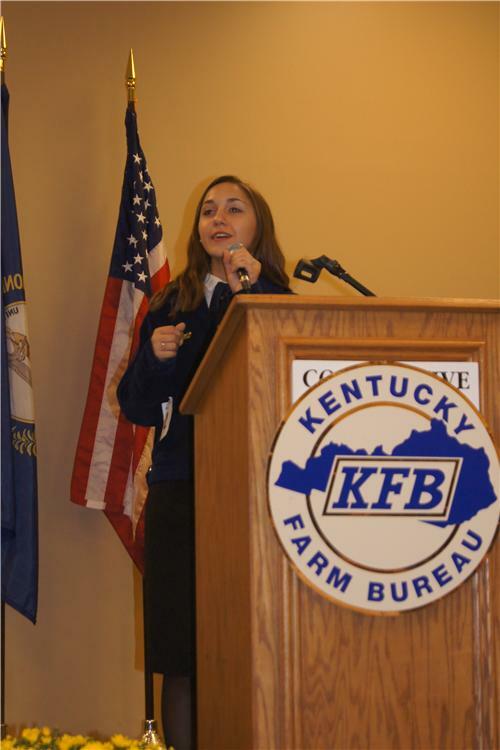 The 2016 KYFB State Annual Meeting will be held at the Galt House in Louisville Nov 30 – Dec. 3.